I was a sophomore in college when I started writing The Pantry Raid. This meant that I was living in the dorms, which sequestered me from easy access to a kitchen. I started a cooking blog while home for the summer, forgetting that I might not be able to keep up with myself when I returned to the world of extra long twins and shared bathrooms. Although I’ve graduated from dorm living (and from college in general, woohoo! ), I’ve managed to maintain nomad status all the while. 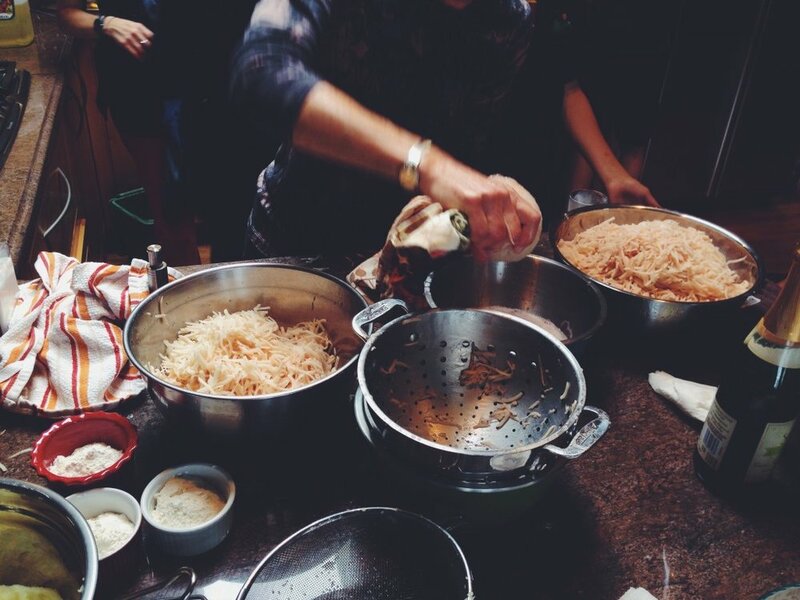 The food I’ve made in each kitchen is defined by the space in which it was created. The taste of turkey burgers will forever be associated with home, just as Carbonara is with my wacky Roman apartment. Trader Joe’s anything tastes like my first big girl apartment, as Chicken Tortilla Soup reminds me of the best best friends in the world and crunchy fruit crumble screams my first summer in San Francisco. The kitchens I cook in rarely get much attention on this blog. Considering how friggin’ important they are to the existence of this blog, I think they finally deserve a little attention. My story (like all of ours) is a collection of places and flavors. I recently wrote about the myriad food phases I’ve gone through since 2011. These are the times and places where I learned, grew, and ate my heart out. If I’ve cooked with you or for you in any of the below kitchens, thanks for being a part of my life and my exploration of food. I hope it was delicious! Casa di Mintz, or ‘Mintz House’ for those of you who don’t speak Italian, is where I grew up. The kitchen, which sits smack dab in the middle of the house, is where The Pantry Raid began. After a lengthy remodel, the grouted white tile countertops are gone, the warped wood butcher block has been discarded, and the Drawer of Death has, finally, died. Even in its new, sleek white slate ensemble, the kitchen has remained the centerpiece of the house, a beaming white beacon surrounded by antiques and creaky wood floors. No matter which other kitchens I pack up and leave behind, this one will always be mine to come home to. I was given one rule when I moved to Boston for college: Don’t go to Dorchester. This, a piece of sage advice from an older and wiser native, was completely ignored the second school began. My roommate and I needed to go to Target, so we hopped in a cab that dropped us off on the front steps of the Dorchester branch of Target. My big-ticket purchase was a ten dollar frying pan and a 99 cent set of 5 wooden spoons. Never mind that there was hardly enough room for the three of us in room 610, and that our expertly outfitted kitchen consisted only of a microwave and an iron. This frying pan was gonna be my ticket out of the same old same old dining hall slop. Though the common rooms in the Little Building, where I lived, had an equally minimalistic kitchen setup, I was determined. With a grocery bag full of who-knows-what from the Prudential Center Star Market and my frying pan and cavalry of spoons in tow, I absconded to the Colonial Building, a much newer and ‘high tech’ dorm. While I was staving off infections and wondering about the mysterious stain on my carpet, Colonial residents were living a life of luxury complete with single rooms, better Wi-Fi, and kitchens on every other floor. We’d navigate the staircase looking for a free kitchen, often resolving to share, if we had to. These kitchens were sterile feeling, like most rooms in new dorms. The fixtures were nondescript, the stove – electric, and the oven was splattered with burnt banana bread batter (my bad). 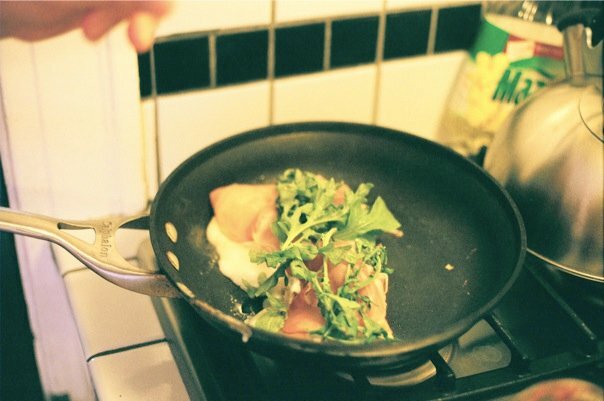 No matter how flimsy my frying pan, how splintery my spoons, or how sub par the food probably was, I was cooking. It wasn’t my kitchen, but it was as close as it was gonna get. Sounds Like: Vampire Weekend and whatever college freshmen talk about. Feels Like: Better than the dining hall. A boyfriend with a kitchen is just about the best thing you can hope for when you’re a college girl with a food blog. 46 Park Vale was home to three crazy dudes, a particularly epic 19th birthday party of mine in which one of the guests dislocated her leg while dancing, and the cutest darned kitchen you ever did see. The tiny square room was peppered with tiles etched with tiny dancing Italian chefs, a tiny breakfast table squished between the fridge and the (gas!) stove, and an equally tiny window, which looked out onto the rusty fire escape that ran down the side of the brick building. The kitchen was small, and it was the kind of dirty that only three 20 year old guys can make happen. Yet it was my favorite escape from school. Matt and I cooked steak, shrimp scampi, and probably a lot of bacon in that kitchen because that’s what adults do! Looks Like: A recycling center dedicated to empty Rolling Rock bottles. I had a panic attack before I moved to Rome. Standing in the doorway of the kitchen at Casa di Mintz, I whined to my dad, “I don’t know how to cook, how am I going to survive? ?” Yes, you did the math correctly – I did already have a food blog at this point. We’ve already covered the fact that I was a major poser, okay?! Little did I know that one does not need to worry when moving to Italy without a meal plan. You could get away with eating only pasta, and no one would say, “That’s so college” years later because it’s Italy and that’s what you’re supposed to do! The kitchen at via Nomentana 225 was weird. There was the tiny fridge that seven girls managed to share, the oven that featured nothing more than an ‘on’ switch (okay, maybe we just couldn’t figure it out), the washing machine (? ), a cabinet that doubled as a display case for our collection of empties, and a giant table, around which we sat hunched over fried potatoes at 5AM on most weekend nights/mornings. The kitchen was the scene of family dinners, where we’d invite our friends over for real adult dinner parties. No one told us that you weren’t supposed to pass around a 3 euro liter of vodka at dinner parties or that each guest wasn’t supposed to consume an entire bottle of wine. Most of what I cooked in Rome was tomato sauce pasta, springy arugula salad with the sweetest tomatoes on the planet, and strangely, udon noodles. Occasionally, I’d stop by the warehouse market near the train station and pick up a salmon steak and later cook it on the itsy bitsy stove that you had to light with a match. If we’re being honest though, most of what I did in that kitchen was eat potatoes and drink wine. When I moved into my very first apartment, I was stoked. My grandma got me the KitchenAid mixer of my dreams and I could now officially cook whenever and whatever I wanted. The room was a narrow rectangle, leaving very little passing space and a max capacity of about 1 1/2 humans. The plastic imitation granite countertops were often cluttered with oils, spices, and cooking wines. The counter didn’t quite extend to the edge of the old stove, leaving a clear pathway for the mice that haunted our apartment to wreak and squeak havoc. I’d later discover a mouse stuck to a landlord-placed sticky trap. I screamed and ran away until the groundskeeper removed it and “set it free.” It was here that I fell head over heels for Bon Appetit magazine, almost started a massive grease fire with some botched pot stickers, and ate my way through the entire Trader Joe’s frozen food aisle inventory. Here I learned about quinoa and chia seeds, pork chops and custard. I’m pretty sure I spent the entire summer of 2013 either in this kitchen or at Magazine Beach. Though I was desperate to leave by the time our lease was up (#roommateprobs), I was sad to leave behind the first kitchen that I considered mine. If there’s another kitchen besides the one at Casa di Mintz that really feels like home, it’s on Juanita Way. I spent that first summer in San Francisco living with my aunts, Sydney and Justine, and cousins, Gabe and Mateo. Without knowing me much beyond holiday chitchat and family vacations, they took me in and made me feel right at home. Unlike at the Bungalow, their Tupperware drawer was organized (a lesson I had to learn the hard way) and the cleaning solution under the sink actually got its fair share of use. The countertop is speckled black and brown granite and the shimmery tile backsplash changes color depending on the time of day, first purple, then silver, then somewhere in between. Here was a real deal stovetop equipped with pots and pans that didn’t come from Target OR craigslist! I remember making my first omelet here and being shocked at how evenly cooked the egg was. No burnt spots! Everyone, go out and buy a Scanpan, I’m tellin ya. In this kitchen, I learned about real California cooking, the drought, and that wooden spoons (99 cent or otherwise) do NOT belong in the dishwasher. Sorry Justine! The kitchen at Bobcat Ridge Avocados, where I began my WWOOFing adventure, was madness. Spacious, yes, but this place was jam packed with cookbooks, mason jars, cutting boards, clean dishes, and dirty ones. This place was a lab, where homemade cream cheese hung from a makeshift cheesecloth sling and dripped whey into a mason jar, where that whey was used to make overnight wheat bread in Ken’s bread machine, and where I learned that being a vegetarian wasn’t so hard after all. The fridge was plastered with holiday cards, family reminders, and photographs and the cupboards were filled with jars of mysterious powders and beans. The fridge was packed with whatever was picked the day before and Tupperware upon Tupperware of leftover ratatouille, artichoke almond spread, and homemade yogurt – you name it. Aside from the time I tripped over a scalding hot oven rack that I’d (in genius style) placed on the ground, I have nothing but good memories from this kitchen. I shared my first San Francisco apartment with none other than my grandmother. Her two-month sublet overlapped with my first two months of “real life” and she was lovely enough to ask me to join her. Our apartment was long and skinny. The narrow hallway let off into bedrooms and bathrooms, emptying out into the kitchen. As with many VRBO’s , this one was outfitted with IKEA things and the stuff left behind from previous guests. In just a few trips to Costco, Rainbow Grocery, and Whole Foods, Savta (grandmother in Hebrew) had stocked the fridge and cupboards with the nicest healthiest foods you could dream of. I’d come home sweaty from my hilly bike ride to the wafting smells of teriyaki salmon and find her casually cooking up a feast for us. It wasn’t a perfect kitchen – the dishwasher was across the room from the sink, the knife blades would frequently separate from their handles, and there was no natural light to speak of, but that’s not the point. The point was that I got to spend two whole months cooking and eating and catching up on 22 years of not much time spent together with my grandmother. We sat around the splintery wood table in the crappy IKEA chairs dipping French bread in Amphora Nueva olive oil more times than I can remember and I wouldn’t change a thing. Unless you work at a restaurant, it’s not often that your office’s conference room is actually a kitchen. I guess it’s also not often that it’s not actually a room at all, but a sectioned off section of a work loft stuffed with 15 twenty-somethings. Chewse, the amazing place I get to work at every day, is an extraordinary place for many reasons, but the kitchen – and how often we use it – is one of my favorites. The birchwood table in the center of the room is our conference table as much as it is our break room table, our serving station, and our prep area. We sit around it every day for lunch and every Thursday night for a feast cooked by one of our own. The kitchen itself is another wall-installment like the Bungalow, and just as dirty. The counter is home to a hodgepodge of things, including, but not limited to, a drying Chemex and a complimentary “I’m pretty sure we partied” mug, a potentially hazardous toaster, a collection of Sriracha and other hot sauce things, some stray Furikake, and probably a few dirty mason jars. It’s not as glamorous as it sounds, but it’s a real kitchen. You won’t find any passive aggressive notes or Kuerig coffee machines here. There are no crappy paper cups, nor obligatory bowls of snacks no one eats (we keep those in the cupboard). This is a real kitchen where real people cook real food. At work! The kitchen isn’t the only reason, but it plays a big part in feeling like I’m coming home every morning when I get to work. Sounds Like: Goofy Friday mornings, grinding coffee, long discussions about sandwich sogginess, longer conversations about sandwich dryness.